CEO Cathy Malkemes with her dog, Maggie, at the Women's Animal Center in Bensalem. Malkemes adopted Maggie five years ago after the two bonded at the center. The organization, founded 150 years ago, now includes a veterinary hospital and an animal shelter. That will change, said Catherine Malkemes, the shelter’s chief executive officer, and Suzanne L. Bush, president of the shelter’s board of directors. 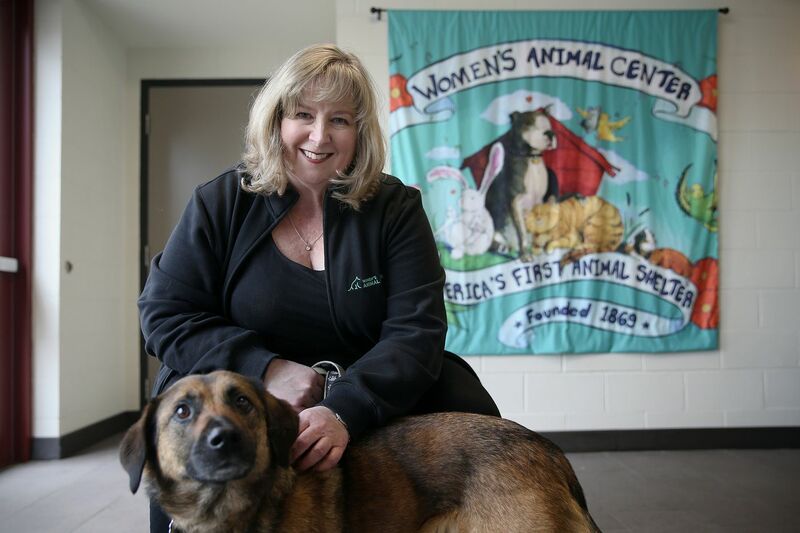 On April 14, the Women’s Animal Center, recently renamed from the Women’s Humane Society, will celebrate its 150th anniversary — a significant milestone, shelter management says, and one that will highlight the organization’s roots. Volunteer Ken McKinney of Bristol, sits with Loki, who is awaiting adoption, at the Women's Animal Center in Bensalem. McKinney said he is starting his 14th year as a volunteer with the center. "We wanted to focus on the women because of the history and the fact that these women were so courageous and innovative,” Bush said. To celebrate, there will be parties. A ribbon-cutting. A National Animal Shelter Day of Service, during which shelter officials hope people will volunteer, donate supplies or money, or adopt a pet. A ceremony around the shelter’s newly granted historical marker, to be staked this fall at either the Pennsylvania Women’s SPCA’s original meeting site at 923 Walnut St., or its first office, at 1320 Chestnut St. They hope it will amplify the shelter’s history. Consider the way the shelter started, Malkemes said, sitting in her office, as she carefully opened the organization’s first annual report, dated 1870. Veterinary technician Melody Vaio feeds Congo, a dog awaiting adoption, medicine embedded in food at the Women's Animal Center in Bensalem. On April 14, 1869, she said, a little more than two dozen women clustered in the parlor of a Philadelphia home to talk about a troubling issue. They saw that carriage horses were beaten, overworked, and malnourished. Stray dogs and cats roamed the streets. Others were corralled in the city’s pound and left to flounder. That remains the mission of the Women’s Animal Center, which in addition to dog, cat, and small-creature adoptions, provides affordable veterinary care for pets and educates the community about proper care of animals. Caroline Earle White, founder of the Women's Humane Society, speaks at the dedication of Philadelphia's Annie L. Lowry Memorial Fountain in 1910.